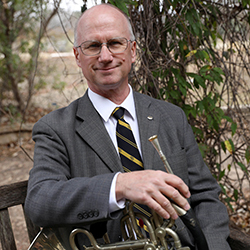 Jeffrey Powers, Professor of Horn, Baylor University School of Music, holds a Bachelor of Arts degree with "Honors in Music" from Austin College in Sherman, Texas, and a Master of Music in Horn from the Cleveland Institute of Music. His major instructors were James London, Albert Schmitter, Myron Bloom, and Roy Waas. He played fulltime professionally and internationally in symphony orchestras for twenty-three years - Second horn in the Hong Kong Philharmonic, Second horn in the New Jersey Symphony, Fourth horn in the Philharmonic of Caracas, Venezuela, Fourth horn and Wagner tuba in the Cleveland Orchestra, and a 16-year tenure as Co-principal horn with the Royal Philharmonic Orchestra of Flanders in Antwerp, Belgium. Mr. Powers is presently principal horn with the Waco Symphony Orchestra and The Abilene Philharmonic Orchestra, and a member of The Baylor Brass and The Baylor Winds. He has recorded 5 solo CDs to date.